Original Story: Continuing with its awesome “rewards” program of giving free stuff to people who Platinum a PlayStation game, Sony is doing the same thing again for Guerrilla Games’ Horizon Zero Dawn. Oddly enough, a lot of users have said that they got the same email even if they haven’t Platinumed Horizon Zero Dawn, or in some cases, don’t even know — or have played — the game. Users from NeoGAF, Reddit, and even our own staff corroborate this same weird mistake by Sony. 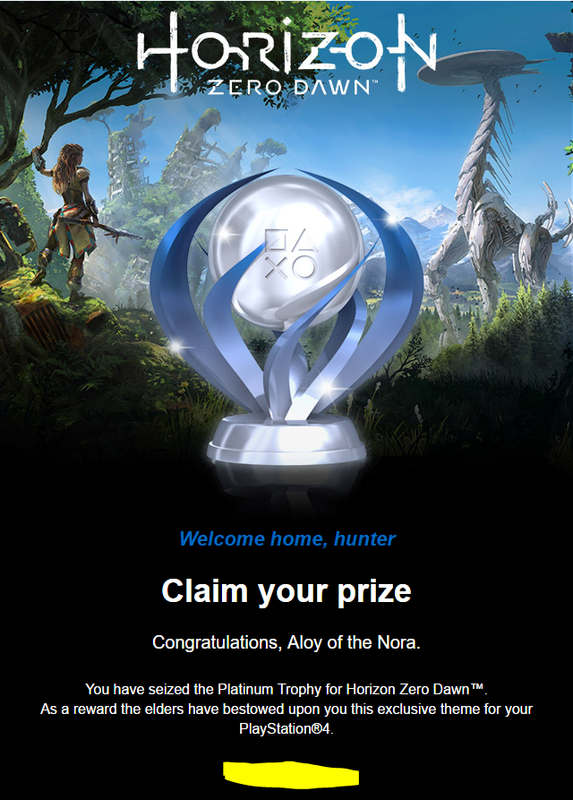 Some people who have not played a second of the game got an email, while others who have actually gotten a Platinum have yet to get their exclusive Horizon Zero Dawn Platinum theme. Hopefully, this gets all sorted out soon, and that everyone who deserves it, actually get one. If you want to get these kind of emails from Sony, make sure that your PSN “notifications” settings are checked off. Of course, this isn’t a guarantee that you’ll get one, as some people have that little box ticked and still didn’t get squat.